A TVLockupView object consists of three views that operate as a single view. The content view typically contains a media item image, like a movie poster, with additional information contained in the header and footer views. The TVLockupView object expands when it comes into focus. It uses focusSizeIncrease and contentSize to calculate the size increase. Provide sufficient focusSizeIncrease values so that your custom content does not overlap other objects when the content comes into focus. The following figure shows a TVLockupView object that is in focus. 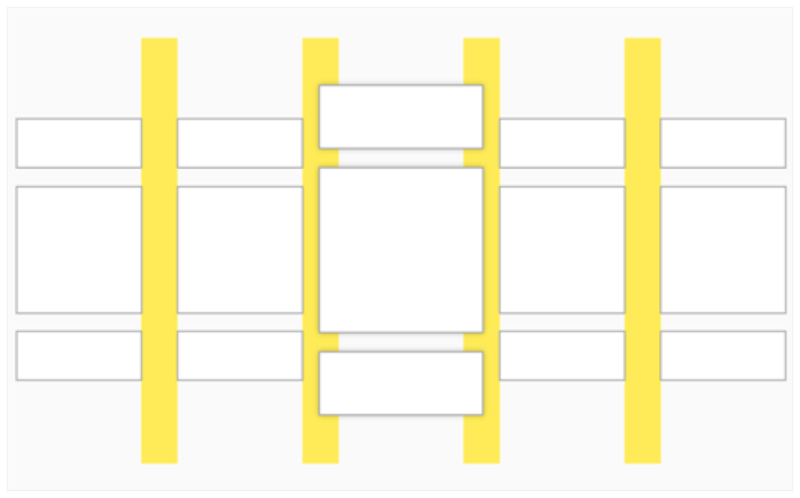 The yellow, vertical lines indicate the space between views. The center view is in focus and has increased in size, expanding into the space between views. Views do not move as other views come into focus. The spacing between the content view and its sibling and parent views. The inset or outset values specifying your content's size increase when in focus. The main view for the lockup. A view containing header information. A view containing footer information.